Clarisford parkrun is a FREE weekly 5km event for runners of all standards, which takes place every Saturday at 9:30am in Clarisford Park, Killaloe, Co. Clare. It is not a race against other runners, but a 5k timed run and it can really be whatever you want it to be, whether that's for fun or as part of a training plan. Every week we grab a post parkrun coffee at a cafe in Killaloe Ballina - please come and join us! Maybe swap stories about your run that day, chat to other runners over a cup of tea or coffee and just be an important part of this new running community. 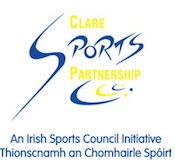 Clare Sports Partnership: The Clare Sports Partnership was established in 2001 by the Irish Sports Council. The mission of the Irish Sports Council is to plan, lead and coordinate the sustainable development of sport in Ireland. The aims of the Irish Sports Council are to increase participation through the removal of barriers, and to make better use of facilities. The Local Sports Partnership Initiative was developed in order to help deliver these aims and to create a national structure to co-ordinate and promote the development of sport at local level. The Clare Sports Partnership provides county wide training & courses for all ages including Active Leadership, Get Walking, Meet and Train, Women in Sport and GOYA. Clarisford Park Ltd: Ballina/Killaloe Sports and Community Facilities Development Company (Clarisford) Ltd is a local voluntary community group set up in large to address a sports and community facilities deficit in Killaloe, Co. Clare/Ballina, Co. Tipperary and the wider communities. Clarisford Park is a 10ha site on the banks of the River Shannon consisting of floodlit playing fields, training pitches, 3G all-weather facility, intergenerational sports hall, running/walking trail and a community park. The Park, set in open grassland and mature woodland on the banks of the River Shannon is a haven for sport, recreation and the environment working seamlessly together. ?